With the upcoming Super Bowl, is it any surprise that race politics dominate the pre-coverage of the game? At one time enjoying professional sports provided a respite from all the mind-numbing back-and-forth of politics. Those days have been stolen from us since former San Francisco 49ers Quarterback Colin Kaepernick disgraced our National Anthem in protest to a perceived injustice involving police use of force against black males—none of which is supported by evidence or data. The American left, the liberal media and race hucksters have made the National Anthem at sporting events an identity politics issue. In a perverted way, the left has made honoring America synonymous with condoning racism in the past and present. They’ve accomplished this by labeling all descending voices that criticized Kaepernick as racists. Even when black players broke away from the pack and spoke out against using the flag and National Anthem as a protest symbol, they were seen as not being down with the struggle. Dallas Cowboy quarterback Dak Prescott, an African-American himself, found this out when he voiced an independent opinion. 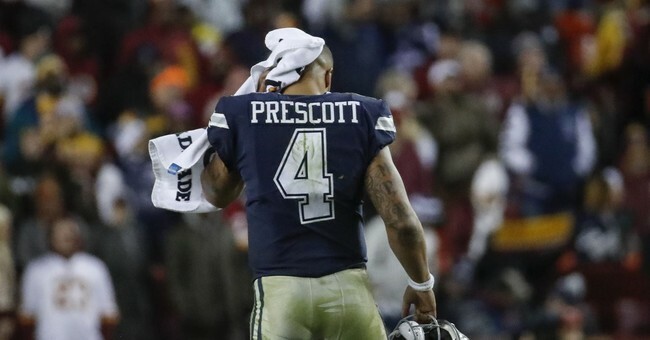 He had said, “I never protest during the anthem and I don’t think that’s the time or the venue.” Prescott’s reasonable comment ignited a firestorm of criticism on social media making him a target of ridicule from race hustlers for his nonsupport of the movement. Translate that to mean that Prescott was not authentically black. Entertainer Kanye West also found out what happens when a black person exercises independent thought, specifically with his support for President Donald Trump. Many agenda-driven charlatans took to the airwaves, suggesting West was suffering from mental illness and must be off his meds. Singer Gladys Knight is now their new target. Knight was offered and accepted the honor of singing the National Anthem in her hometown of Atlanta Georgia at this weekend’s Super Bowl. Unfortunately, she’s getting Dak Prescott and Kanye West treatment for accepting this honor as if she is committing the ultimate betrayal of her race. However, Knight pushed back and reminded her critics that she has “been in the forefront of this battle longer than most of those voicing their opinions to win the right to sing our country’s anthem on a stage as large as the Super Bowl.” I would call that a mic drop moment. Imagine the real injustice black singers faced in the music industry during the 1950 and 60s. This brings me to this litmus test applied by black gatekeepers in this game of plantation politics where no competing view is allowed and is viciously attacked when one is put forth. First off, who appointed them the arbiters of who is really black and who isn’t; what it takes to be black; and how one goes about getting their booked stamp of being authentically black? We all know the liberal media and university intelligentsia are more than happy to offer these gatekeepers the platform to attack a person’s blackness and cultural identity. However, just because they have that platform does not mean there should be no seat on that stage for a counter view. Why are the race hustlers so afraid of a plurality of views? Might it be that their lies will be exposed? Moreover, why is it that when a black person expresses independent thought outside of liberal orthodoxy that it is automatically attached to his or her cultural identity? I know first-hand about this having been attacked with some vile references from black people for my well thought out independent thinking on issues of race, crime and politics. What other race does this to each other? Is Rush Limbaugh called a traitor to his race by white liberals for being a conservative? No. His cultural identity doesn’t become a part of the discussion. The criticism of Limbaugh by white liberals stays focused on his political views and nothing more. Some may claim he is racist, which he is certainly not, but not a traitor to his race. Why doesn’t that standard of separating thoughts and views from cultural identity apply to Supreme Court Justice Clarence Thomas, Dak Prescott, Kanye West, Gladys Knight or even me? It’s because race hustlers have declared—with no license to do so—that to be authentically black is to never stray from the plantation of liberal ideology by any independent view from the race provocateur’s predetermined race-based orthodoxy. Folks, this is sociopathic behavior. I left that plantation a long time ago and have no intention of returning either voluntarily out of intimidation or by capture regardless of the hate and vitriol hurled my way. I’ll determine and define what it is to be authentically black, and it’s black like me.